n a land far away, a king ordered his servants to enhance his clothing with embroidery to show his wealth and individualism. This elegant detail set him apart from the commoners and established him as a higher power. 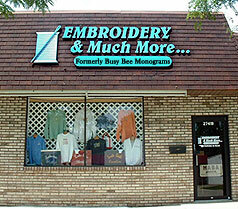 Centuries later we use embroidery to individualize apparel to identify with a certain monogram or logo. Whether we are adding a three-letter monogram to a sweater or digitizing a company logo for shirts, we take the time necessary to help make that same impression the king demanded long ago. Our two main concerns are; first, making the customer happy and secondly, achieving the best quality in every design. With every design we work on, we use our expertise in the embroidery industry to start with the customers’ ideas and develop those ideas into stitches. Our customers’ imagination is our only limitation. We love what we do and hopefully you will also love what we can do for you. Browse though our web site and see many of the beautiful items we have created. There are catalogs for apparel and also pages of many of the stock designs we can use to embellish your next order. If you don’t see what you need, just email us and we can search our extensive offerings to find your particular item. Our expert digitizers on staff also can re-create your company logo to embellish your workplace too. Apparel with your company logo gives a professional and well-groomed look to all employees. Give us a try and see why we have been in business for over 30 years. Enjoy your search here and remember to email us with your questions. We look forward to hearing from you soon.